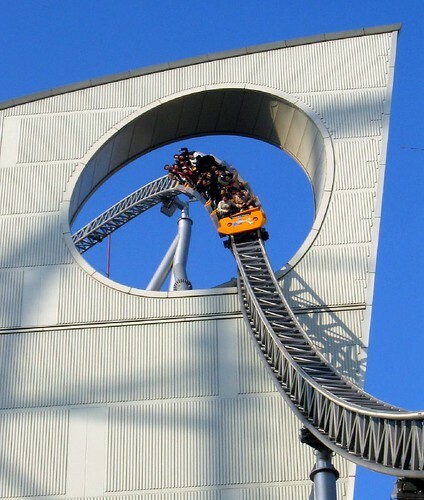 Thought Experiment: Should Roller Coaster Designers Design Public Transit? Image by flickr user Mike D.
Disclaimer: This post in no way, shape, form or description advocates using roller coasters or thrill park rides as mass public transit. Should Roller Coaster Engineers and Theme Park Designers participate in the design of public transit? Probably an insane idea; no doubt completely and 100%. But also probably worth exploring, if only in a space as limited as a short thought experiment on a niche blog. To begin, a presumption: Thrill Ride Engineers and Designers are very much in the same business as Public Transport Planners. Though neither is likely to admit it, both at their cores are in the business of moving people in pursuit of a larger goal. Neither move people just for the sake of moving them. Public Transport agencies move people for a whole host of reasons: Increased mobility, social inclusion, economic development, decreased car emissions, traffic reduction, etc., etc., etc. Rarely, however, do transit agencies consider such things as enjoyability to be an important motivator behind transit planning decisions. Roller Coaster Designers, meanwhile, move people in order to evoke a feeling from riders. That feeling can be awe, terror, joy, whatever, but the fundamental work of a Roller Coaster Designer is to provoke an emotion in people that would not exist if not for the environment and motion that designer creates. Yet despite their implicit similarity, the metrics used to measure success in each industry are completely different: The first is quantitative, cold and mathematical. The second is qualitative, experiential and emotional. A second presumption: Public transit ridership is at least in part dictated by the enjoyability of the ride itself. Public transit ridership is oftentimes low in western society. Furthermore, people who ride public transit tend to do so grudgingly and are only willing to pay a few dollars at most per trip. If we believe the second presumption to be true (which it may not be), then we can logically assume that part of the reason for this low ridership and grudging acceptance is due to a dissatisfaction with the enjoyability of the system itself. On the flip side, groups of families and friends will travel great distances for the privilege of attending a theme park, spend hundreds of dollars to do so and be willing to stand in lines of an hour or more for the thrill of a two minute ride. Again, the enjoyability of the ride experience must therefore be high enough such that large volumes of people are motivated to endure significant hardship merely for the pleasure of a short ride. This isn’t to say we need roller coasters instead of public transport (though some people will surely decide that’s exactly what I’m saying). It is to say, however, that if ridership and ride enjoyability are connected then in order to increase public transit ridership we must therefore improve the experience of public transportation. It might therefore be wise to consult with individuals who actually understand those emotional things which are currently lacking in our assumptions and models about public transit ridership. Hence Roller Coaster Engineers and Theme Park Designers. Humans, after all, are emotional creatures and it seems logical to engage with people who understand how the emotional experience of transportation impacts a human’s heart, mind and soul and how we can best calibrate those experiences to best align with a transit agencies’ need for increased ridership. And again, just because the internet has a way of twisting people’s words: This was a thought experiment. I don’t believe we should be replacing public transit with thrill rides and roller coasters. Re the disclaimers: Boo! I'll say it. Replace public transit with thrill rides! Call it the express. Get from the top of a hill to a downtown subway line 3 miles away in under 2 minutes. Of course the ride home takes 10 minutes with a constant "tink tink tink tink" sound as you're pulled up the hill. Great post! I totally agree that public transit needs to be enjoyable in order to be widely embraced. Maybe instead of, or in addition to, roller coaster designers, public transit should look to luxury car designers. People pay extra for a smooth ride, heated seats and entertainments systems in their cars, so it makes sense that they would appreciate those kinds of features in public transit as well. Public transit is already massively expensive, why not invest a little extra in comfort and fun? @Steven. Are you familiar with Doppelamyr's "Mountain Glider"? It shows what can happen when transit designers try to design amusement rides. http://www.youtube.com/watch?v=Ij4oZ-yusmU&feature=youtube_gdata_player This is a look to the promo video. The only installation was in Belgium at amusement park. It was dismantled after a year or so after reliability issues. There was a test track in Wolfurt that may or may not be there still. I was there two years ago and it was still up. I have heard rumours that it was taken down though. Rollercoasters are fine, but what we really need are extensive networks of public ziplines. It seems quite a bit of public transportation comes from amusement parks. Disneyland has both a gondola and a monorail. The very first freeway, The Arroyo Seco Parkway from Pasadena to L.A, was designed from the outset to be fun to drive. Dips, banked turns, surprise corners . . . all those were probably a blast if the road was mostly empty and the driver was wide awake. As it is, the road has racked up a pretty significant death toll. Sometimes boring is good! Ziplines for transit are a good idea. One problem is the 'people per hour' will be low unless 2 systems are built side by side. All that's needed: Two stations each with a pillar that can be raised and lowered depending on the direction of travel and required speed. The rope is fixed to the top of each pillar with a launch and landing track for the carriages. Passengers take their seats in the carriage, then the pillar is extended. The extended height of the pillar would need to be higher than its destination. This would work well for relatively flat landscapes. Cabins would be narrow, 2 seats wide, and load from both sides. Cabin sizes could be variable up to 16 people. Carriages would have a battery powered braking system with control signaling provided through the rope. If traveling up 600 vertical feet to a station an extendable pillar would prove difficult. A fixed tower with a rope and launch/landing track that moves up and down the tower would be used instead. This could make for some interesting tall construction projects with viewing platforms and snack bars at the top of the tower, wind power, and communications arrays. I haven't completely though out safety systems yet, but I'm sure they will come to me.